Concerning the role of obedience training, people often ask themselves, “Why should I spend the all that time to obedience train my dog if it’s just going to be a pet and spend most of its time in my back yard?” I guess I would have to say that that in itself would be the most important reason of all. You've just answered your own question about the role of obedience training. Simply said, for the time you would spend with your dog and all the bonding that would happen as a result! Not to mention all the by-products: fun and enjoyment, a well-trained dog, exercise for both of you and a mind strengthening experience for the dog. I know of so many dogs who are left alone almost all of the time and I'm sure you can think of many as well. These dogs would love a few minutes a day spent with their owners in obedience training, I'm sure, just for the personal attention they would receive, if for no other reason. Dogs that spend time with their owners, in training, playing, or sharing any type of activity quite often develop less destructive behavioral habits, since these habits quite often stem from boredom due to lack of mental and physical stimulation. When you train your dog you are establishing a bond that could one day save your life. Who knows? This is perhaps one of the best illustrations of the role of obedience training in your relationship with your dog. You are also establishing yourself as the ALPHA DOG (the leader, #1, "head honcho") in your relationship, and since dogs are pack animals by virtue they do need an alpha dog to relate to in day to day activities. Not only will obedience training be an excellent learning activity and great mental stimulation for your dog, it is also a great activity for the dog owner. 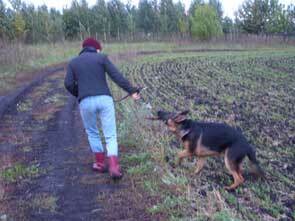 For example, obedience training is very good exercise for the owner as well as for the dog itself. It can be very relaxing after a hard day at work to come home and spend some training time with your dog. Many studies have proven that people who have pets recover faster from illnesses than those who do not have pets, that pet owners have lower heart rates, and many other signs of better health than their petless counterparts - so get out there and train your dog, it will be good for both of you. Who knows, after a few weeks of training you may be able to wear those clothes hidden in the back of the closet that you haven't been able to get into in years. Another plus of the role of obedience training: any dog that is obedience trained is also a very confident dog and one that is a pleasure to own, not a royal pain in the you-know-where. There is nothing worse than a dog that will not listen to you and basically doesn't respond to anything you want, request or command or threaten. It's not necessary to spend a lot of money on an obedience classes since there are a lot of good trainers out there and a lot of places you can take classes at. If you choose not to go to a class there are a lot of good books on training that you can buy or check out at the library or find online that can give you a lot of information, training tips, etc. Now on to the really obvious reasons best explaining the role of obedience training your dog(s). Any dog that is well trained, especially for the "come" or "down" commands can have its life saved by knowing only these 2 simple commands. If a dog can be stopped dead in its tracks by responding to either of these two commands, you are thereby saving the dog serious injury or worse, death, the owner all kinds of mental anguish, and a lot of money in hospital and vet bills! Best of all: a well trained dog is truly something to be very proud of and to be admired and enjoyed by all. Seeing one working is truly like looking at a fine piece of art - a magnificent thing to be enjoyed by all! The role of obedience training cannot be overemphasized.